Today's post, "The Two GOP Establishments," a short, intriguing article by E.J. Dionne, Jr. at Truthdig.com, gives us another take at the Civil War within the GOP. "The language commonly used to describe the battle going on inside the Republican Party is wrong and misleading. 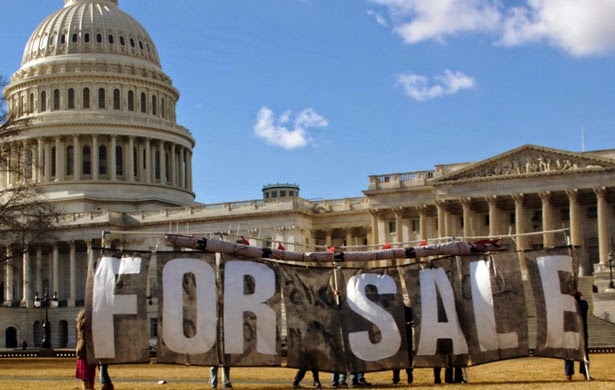 The fights this spring are not between 'the grass roots' and 'the establishment,' but between two establishment factions spending vast sums to gain the upper hand. 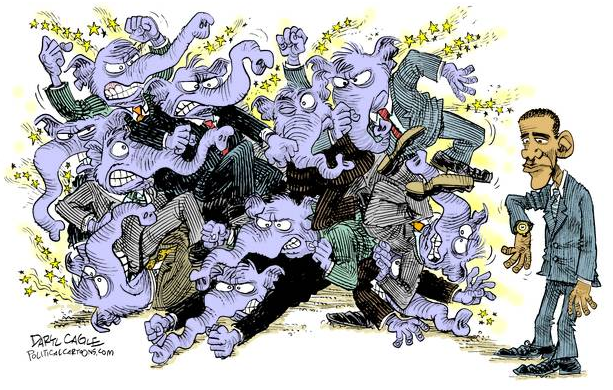 "Their confrontation has little to do with the long-term philosophical direction of the GOP. 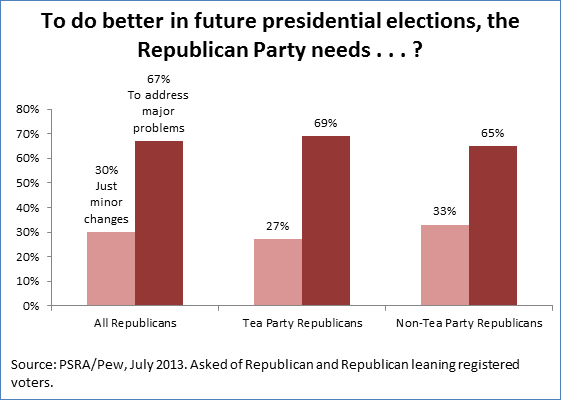 Very rich ideological donors, along with tea party groups, have been moving the party steadily rightward. Political correctness of an extremely conservative kind now rules. "This explains the indigestion some Republican politicians are experiencing as they are forced to eat old words acknowledging a human role in climate change. It’s why party leaders keep repeating the word 'Benghazi' as a quasi-religious incantation, why deal-making with President Obama is verboten, and why they stick with their 'repeal Obamacare' fixation. "The accounts of Tuesday’s Republican primary in Nebraska for an open U.S. Senate seat are revealing. Ben Sasse, a university president who held a variety of jobs in George W. Bush’s administration, won it handily. His success was broadly taken as a triumph for the tea party, which just a week ago was said to have suffered a defeat in North Carolina. There, Thom Tillis, the speaker of the state House of Representatives and the so-called establishment candidate, faced opponents perceived to be to his right. Yet Tillis will be one of the most right-wing candidates on any ballot this fall. "The more instructive way to look at the Nebraska result was suggested by a report on the outcome in The Wall Street Journal by Reid Epstein. Sometimes, news stories are like good poems that convey meaning through artful—if not always intentional—juxtaposition. "So, is this really the grass roots speaking to Washington? Or is it more accurately seen as a cadre of conservative groups largely working out of Washington rising up with a ton of cash to persuade voters to listen to them? It’s hard to see Nebraska’s primary as a mass revolt. The Nebraska secretary of state’s website reported Wednesday morning that primary turnout (in both parties) came to 316,124 out of 1,152,180 registered Nebraskans. Sasse won with around 110,000 votes. "The grass roots claim becomes more problematic when you consider that Sasse has rather a lot of Washington experience while one of his opponents, former state Treasurer Shane Osborn, was the favorite of many Nebraska tea party groups. As Jim Newell noted in an insightful piece in Salon, FreedomWorks, one of the Washington-based operations that latched on to the tea party early, initially endorsed Osborn but switched to Sasse. The stated reason for the turnabout was the support Osborn got from Senate Minority Leader Mitch McConnell who, for the time being, is cast by some on the right as an enemy. "Needless to say, the local tea party faithful who preferred Osborn resented the machinations of the big money groups headquartered in the nation’s capital whose competition resembles nothing so much as a 'Game of Thrones' power struggle. 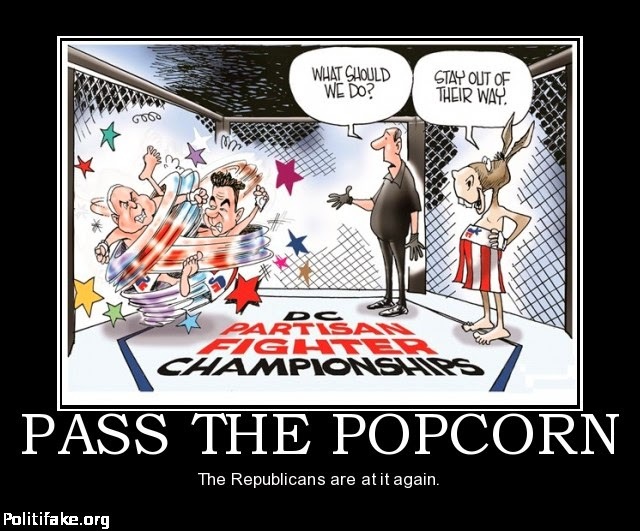 "As for Sasse, his victory speech, as the conservative blogger Matt Lewis pointed out, made him sound more like the next Jack Kemp, the late conservative famed for his compassionate inclinations, than the hard-edged Cruz. Sasse’s triumph reflected his skill at bringing the two GOP establishments together—he’s the George W. guy with Harvard and Yale degrees whom Sarah Palin liked. The 42-year-old bids to become the GOP’s next new thing. "Thanks to Supreme Court decisions opening the way for unlimited and often anonymous campaign contributions, we are entering a time when 'follow the money' is the proper rubric for understanding the internal dynamics of the Republican Party. Washington-based groups tied to various conservative interests and donors will throw their weight around all over the country, always claiming to speak for those 'grass roots.' Primary voters will be left with a choice between two establishments that, in the end, differ little on what they would do with power." 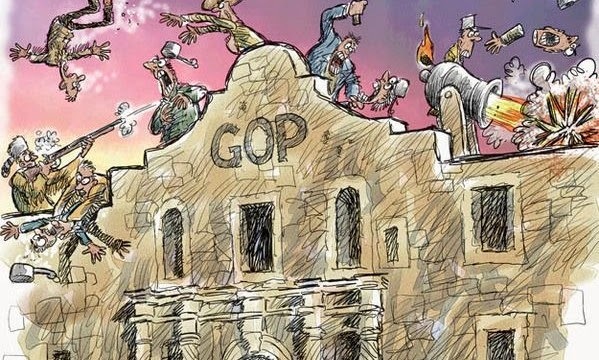 As readers of this site know, we've talked about the GOP Civil War in terms of Tea Baggers vs. the Establishment GOP, crimiminals vs. morons, or the loonies vs. the Country Club and Wall Street Conservatives -- and we have constantly compared the situation as the inmates taking over the asylum. Nor do we believe that the Civil War Is Over, as you may have seen in our piece, "The Raging Republican Civil War." 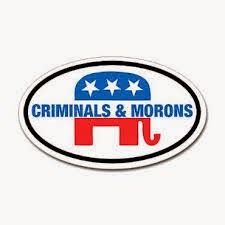 And although the Tea Baggers have lost every primary during this season, with all due respect to the sagacious Mr. Dionne we suggest again that with their sole reason of existence is to serve and protect the richest and greediest among us, all Republicans are conservative, the flip-flop of Freedom Works and the stupidity of Ted Cruz notwithstanding. If we understand the "grass roots" to define the inmates of the Conservative asylum, our definition of the GOP Gang War stands. The new political strategy of the Establishment primary candidates in the age of the Tea Baggers is to veer even more sharply to the right, hoping that the Democrat they run against won't bring it up in their final match. mankind had overdeveloped hydrocarbon energy." Texas Republican State Rep. Joe Barton.